The Slavophiles were a group of thinkers who formulated their common outlook in the late 1830s and 1840s in opposition to the group who became known as the Westernizers (who will be the subject of our next lecture). Their ideas grew from a sense of a crisis of identity engendered in Russia by the process of westernization (see Rabow-Edling 2004, pp. 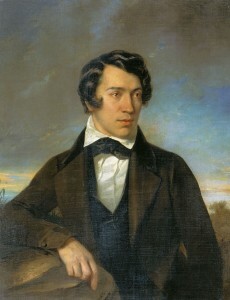 444-7), a crisis that was also very clearly expressed in the literature of this period, for example in the figure of Evgeny Onegin from Pushkin’s 1833 poem, whose western clothes, attitudes and learning barely mask an empty shell, and the isolated individualist Chatsky from Griboedov’s 1824 comedy Woe from Wit, who returns from Europe to speak out against all the faults and corruption of europeanized Russia. So this was not just the minority concern of a few conservatives, but was a major question for educated Russians more generally. But as we saw, attention was drawn to the subject particularly by Chaadaev’s First Philosophical Letter. But on the other hand, the Slavophiles rejected Chaadaev’s contention that Russia lacked any value and in particular any history. Despite their common starting point of a religious conception of history, they came to a very different conclusion of Russia’s position in relation to Europe, and even questioned the very basis of rationalism in their attempt to define a specifically Russian philosophy based on intuitive, non-rational knowledge (Bird, p. 9) for the first time. Our aim is to examine the early theoretical basis of Slavophilism, not its later political off-shoots such as pan-Slavism. Therefore the writers we will be focusing on are the main theologian of Slavophilism, Aleksei Khomiakov (1804-1860), its primary philosopher, Ivan Kireevsky (1806-1856), and Konstantin Aksakov (1817-1860), who was more political and less philosophical than the other two, as well as being somewhat less nuanced in his ideas. 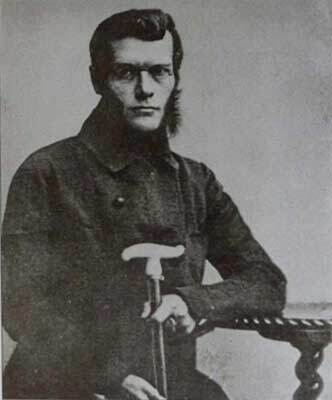 The other figures who made a significant contribution to early Slavophilism are Yuri Samarin (1819-1876), perhaps the most practical of the Slavophiles, who worked on the reforms to emancipate of the serfs, Petr Kireevsky (1808-1856), younger brother of Ivan and a renowned folklorist, and Ivan Aksakov (1823-1886), brother of Konstantin and a famous journalist. Our main figures all came from remarkably similar backgrounds in old gentry families, and indeed their family ties (as demonstrated by the presence of siblings in the group) were important; the idea of kinship played a significant role in their thinking (Riasanovsky, p. 29; pp. 28-59 of this book gives a useful description of the Slavophiles’ backgrounds). They all had strong ties to Moscow, but also to their family estates, where, in contrast to their theoretical work, they were quite progressive. To a great extent their ideas were based on their own experiences of traditional Russian life. Konstantin Aksakov’s father, Sergei Aksakov (1791-1859), wrote a very famous series of semi-autobiographical works depicting life on his estate, including A Family Chronicle (also known as A Russian Gentleman | Russian text). They are a fascinating portrait of the life of the part of the Russian gentry from which the Slavophiles came, as well as being a very enjoyable read. Boris Groys also notes “the influence of Hegel’s and Schelling’s philosophical historicism,” which led to “an orientation towards a variety of unique national cultures, each of which was described as bringing an original and irreducible contribution to human culture in general.” (Groys, p. 186) This was the ultimate philosophical inspiration behind Kireevsky and Khomiakov’s espousal of Russia’s originality, and in general terms, therefore, as a movement Slavophilism was only in fact mirroring a process that was also going on or had gone on elsewhere in Europe, frequently with similar paradoxes (such as eighteenth-century debates on Finnish language nationalism being conducted in Swedish, because that was the language of the educated elite). As Susanna Rabow-Edling suggests, “Romanticism made them realize that the long-lasting practice of imitation had led to an acute lack of a national cultural contribution” (Rabow-Edling, p. 33-4); in other words it awakened their understanding of the very precarious nature of Russian culture (in this they were perhaps not so different from Chaadaev). But this Western influence notwithstanding, “the fact that both Kireevsky and Khomiakov developed their Russian philosophy in contrast to Western thought is a strong indication of their determination to elaborate their own Russian Orthodox philosophy rather than trying to adapt Western ideas.” (Rabow-Edling, p. 32; my emphasis) Thus the fact that much of Khomiakov’s theological work was originally written in French (Hudspith, p. 8) should therefore not be taken as an sign of hypocrisy, but rather as an indication of the circumstances; some of his work could not be published in Russia until after his death, so writing in another language would more easily enable its dissemination. I’ll begin by looking at the opposition of Russia and the West as conceived by the Slavophiles, then move on to examine the historiography that underpins it, then look more specifically at the idea of Russia – and Russian faith – that they propound. I’ll finish with a few observations on the significance of the Slavophiles for later thinkers. One may justifiably be sceptical about this basis of this in fact; Riasanovsky describes Khomiakov’s History as “a peculiar combination of history, philology, and fantasy, but chiefly fantasy.” (p. 71) Nevertheless its logical development does enable understanding of the differences the Slavophiles perceived between Russia and the West, and that is why it is worth exploring. While one might expect Khomiakov to ascribe a common origin to the two, because of their shared Christian religion, in fact he identifies their pre-Christian roots in the opposing principles. Thus Western Christianity’s roots in pagan Rome ally it to Kushitism or necessity, whilst Russia’s ancient tradition of communality indicates its roots in Iranianism or freedom. This has implications for many areas of life; for example, Kireevsky sees it as underlying different attitudes to property and landownership, and the formation of the law, while for Aksakov it signifies different approaches to participation in political processes – these are elements we will discuss in more detail in the seminar in relation to the set readings. In all things Russia is seen as being governed by custom and community, the West by abstract logic and the primacy of the individual. But it is most significant in terms of the religious faith of Russia and the West, as it is these opposing principles that have dictated the different subsequent development of the two branches of Christianity – and indeed their separation; the rationalism that is characteristic of Kushitism is seen as being not only being the guiding spirit of Catholicism, but was even responsible for the Great Schism of 1054, when the universal church was separated into the Orthodox and Catholic churches, less than 100 years after Rus’ had converted to Christianity. Et in Spiritum Sanctum, Dominum, et vivificantem: qui ex Patre Filioque procedit. “Rationalism,” as Walicki states, “acts as a disintegrating force because it transforms reality into an aggregate of isolated fragments bound together only by a network of abstract relationships” (Walicki, p. 101) – i.e., everything is arbitrary, and nothing is held together organically. This is what governs Kushite Europe, which will therefore never have unity; the subsequent Reformation and creation of the Protestant churches is seen as evidence of this. In contrast, Russia is governed by tradition – this key term appears twice in Kireevsky’s assessment of the schism above – which for the Eastern church is the very essence of faith and can never be superseded by reason or logic (which are seen as the antithesis of faith; simply put, God is a matter of the spirit alone, and cannot be be found through the workings of the intellect). a commune is a union of the people, who have renounced their egoism, their individuality, and who express their common accord; this is an act of love, a noble Christian act, which expresses itself more or less clearly in its various other manifestations. A commune thus represents a moral choir, and just as in a choir a voice is not lost, but follows the general pattern and is heard in the harmony of all voices: so in the commune the individual is not lost, but renounces his exclusiveness in favour of the general accord – and there arises the noble phenomenon of harmonious, joint existence of rational beings (consciousnesses); there arises a brotherhood, a commune – a triumph of human spirit (Konstantin Asakov, PSS, 1:291-2, cited in Riasanovsky, p. 135; my emphasis). And, vice versa, it is only when individuals are guided by tsel’nost’ dukha that they can form the organic unity of sobornost’. This is possible in Russia, where organic unity has not been lost, but in the West, it has been lost because of the disintegrating force of rationalism; the different spheres of life (such the moral religious, economic, intellectual spheres) have been separated from each other and are in conflict rather than supporting each other (Walicki, p. 101), destroying both the inner life of the individual (their integral personality and knowledge) and the bonds of community (sobornost’). The idea of unity, therefore, is as pivotal to Slavophile thinking as it was to Chaadaev, but contrary to Chaadaev, they perceive Russia as being characterized by unity and Europe as fragmented and individualistic – and in fact this becomes the standard equation for many thinkers from very different backgrounds. But does this necessarily entail that the elite existed in perfect harmony with the peasants prior to Peter’s reforms? Where then does serfdom fit in to the equation? According to the Slavophiles, serfdom was only consolidated by Peter the Great, but most historians contend that it was well established before then – and certainly, we saw that Chaadaev identified the roots of serfdom in the Orthodox church and in the state before Peter the Great: “Why, on the contrary, did the Russian people fall into slavery only after having become Christian, namely in the reign of Godunov and Shuiskii?” (Chaadaev, Letter II, pp. 35-6) So we might accuse the Slavophiles being somewhat disingenuous here, altering history to suit their own purposes. These writers do frequently attract criticism for this reason – there is a lot of very sceptical writing about the Slavophiles. Thus, for example, the accusation that Khomiakov “conceived an ideal of the church as disconnected from the exercise of worldly power” and “invent[ed] the religion he wished to believe in” (Engelstein pp. 144-5), indicates his tendency to ignore the church’s actual role as a centre of authority rather than supporting Russian spiritual unity as he claimed. But this question, relating to the Slavophiles’ critique of Peter the Great’s reforms, is central to their relationship to the Russian government. Although they were conservative, one should not imagine that their vision of Russia’s greatness was in any way welcomed by the autocracy; “The aggressively conservative Nicholas I […] valued the Orthodox Church as an arm of the state, not as the repository of absolute truth” (Engelstein, p. 138), and because the Slavophiles rejected the “church’s subordination to secular authority” (Engelstein, p. 144), their ideas were in fact seen as dangerous. The official doctrine of “Orthodoxy, Autocracy and Nationalism” notwithstanding, the government viewed itself as a modern western power and had no interest in a return to standards of pre-Petrine Russian life. Moreover, any intervention in politics at this time was forbidden: “Official Nationality meant not only the propagation of government ideology by all possible means, but also a ban on every other form of thought.” (Riasanovsky, p. 11) The Slavophiles were independent thinkers, and as such were deemed as suspicious as any other grouping at the time. They were not subject to arrest, as for example members of the Petrashevsky circle, including Dostoevsky, were in 1849. But they were frequently subject to censorship, despite their general support for the autocracy, which was implicit in many of their works, and explicit in the case of Konstantin Aksakov. Thus the following things are posited against each other: the retention of an age-old custom, based on the fundamental principle of life and feeling, the right of all to own land and each one to use it, the moral link among people, and the moral, ennobling education of the people in the social sense by means of constant practice in communal justice and administration, with full publicity and rights of conscience, and against what is this posited? Against the violation of all popular customs and feelings, the concentration of property in relatively few hands, and the proletarization or at least the hireling status of all the rest, the dissolution of mutual ties among the people, and the absence of any social and moral education (Khomiakov, PSS, 3:290; cited in Riasanovsky, p. 134). Whether that sense of inner freedom is compatible with a system of political despotism that they generally seem fairly willing to justify is another question; Riasanovsky is one of many commentators who doubts it, and I would have to agree. A number of problems are therefore apparent in Slavophile thinking, in relation to their tendency to ignore inconvenient political and historical realities and create a fantasy version of Russia’s past. Nevertheless, they remain very important figures, because, through Khomiakov in particular, they established a tradition of secular theological writing in Russia which continued to develop and produced some of Russia’s most significant religious philosophers, such as Vladimir Solov’ev, at whom we will be looking next term. Moreover, the vision they propounded of Russia, and in particular the significance they ascribed to the commune and the peasantry, had a profound influence on later thinkers. Dostoevsky certainly shared some of their ideas, in particular on the question of spiritual unity. In fact, in many ways he goes further than the Slavophiles, in his idea of the God-bearing role of the Russian peasantry. 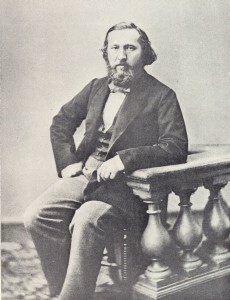 But he developed those ideas in the late 1860s and 1870s; he was not a Slavophile at the time their influence was at its greatest, and I would suggest that he should not be categorized simply as a Slavophile – his fictional writing at least is too complex and varied to be subsumed under a single ideological label. Dostoevsky, in his post-Siberian period at least, was a conservative, and therefore might be expected to share some aspects of Slavophile ideology. However, their ideas on the commune and the narod also had a major impact on radical thinkers, contributing to the development of distinctive non-Marxist Russian theories of socialism, as we shall see later in the course in Herzen’s work on Russian socialism, Bakunin’s anarchism, and the populist theories of Chernyshevsky, Lavrov and Mikhailovsky. And I think they had that influence – and continue to be relevant today – because while Chaadaev may have posed the question about Russia’s destiny and what it means to be Russian, it was the Slavophiles who were really the first to articulate a positive and coherent response to the question of Russian identity. Moreover, they did so not merely by constructing an image of Russianness, but by attempting to develop a philosophy of Russianness, one that was opposed to the rational basis of European philosophy. So exploring the opposing values the Slavophiles ascribed to Europe and Russia, and the reasoning behind this, is essential not only in order to understand their own writings, but also the works of subsequent thinkers. For next week’s seminars, we will discuss in detail the different elements of this opposition between Europe and the Russia, including its social, political, legal and religious dimensions, as it appears in the works of Khomiakov, Kireevsky and Aksakov, and this is what you should focus on when you re-read the texts. The Slavophiles’ terminology certainly reminds of the distinction between gemeinschaft and gesellschaft developed in Germany by Toennies. It surprises me that it seems to anticipate Tonnies by forty years or so. Any thoughts about how this happened? Thanks for this – Walicki’s History of Russian Thought refers to exactly this connection with Tonnies (pp. 108-9), but doesn’t make any suggestion as to how it happened, and I have to admit I don’t know either. A mystery, then! Walcki looks like required reading for me, nonetheless. Thanks for putting these lectures on line; Language Hat sent me. A mystery, then! Walicki looks like required reading for me, nonetheless. Thanks for putting these lectures on line; Language Hat sent me.